In pursuance of its vision to establish state of the art medical facilities in India with high degree Of clinical excellence, Wockhardt hospitals has entered into two strategic alliances with harvard medical international. In August 2002, our company joined hands with Harvard Medical International (HMI) to provide training to healthcare professionals and counsellors in lndia. A non-government organisation (NGO), WHARF, is being registered as the first s to achieve this objective. WHARF is the acronym for Wockhardt-HMI HIV/AIDS Education and Research Foundation. Dr. Joseph B. Martin, dean of Harvard Medical School, recently spent two weeks in India meeting HMI's Indian partners and learning about their accomplishments, concerns, and challenges as well as their hopes for Indian health care. This visit marked the first time the Dean traveled to India to see firsthand the fruits of these ongoing collaborations. It was also an opportunity for Martin to gain a better understanding of India from an historical, cultural and societal perspective. "I think Dr. Martin's visit demonstrated the value that he places on our partnerships with Indian health care leaders," said Dr. Harvey Makadon director of health systems for HMI. Makadon added that Martin, who is the chairman of the board for HMI, has always been extremely supportive of HMI's connections in India and wanted to see them in action. "This was an extremely fascinating and personally gratifying adventure," said Martin. "India is a country of great contrasts. It has to deal with complicated political, economic and health care challenges with 3.5 times the population of the U.S. in a country a third of the size" he said. Martin heard firsthand how WHARF trainee faculty felt about the joint HMI/Wockhardt initiative. Representatives of the new faculty talked about their achievements and challenges, including ethical, social and legal issues. One participant, Dr. Zulica Barretto, felt that one of the most important issues "was not so much the disease itself but the fear of the disease"-a fear that had caused some doctors and hospitals to turn away HIV/AIDS patients. Overall, the faculty believed that the WHARF program had made them recognize the potential scale of the AIDS epidemic and had given them a new model of care that they could both use and share with others to address the HIV crisis. During Martin's visit, Wockhardt Hospitals Ltd. announced the opening of a new private multi-specialty hospital located north of Mumbai. The HMI heath systems team worked closely with Wockhardt to develop a hospital design based on disease-focused multi-disciplinary teams, continuous quality measurement, and patient centered care. They also helped design systems that integrate with community care programs. The Dean was continually impressed with the ability of the Indian health care leadership to develop and implement innovative solutions with modest resources. He also witnessed the ongoing debate over public and private sector responsibilities for Indian health care-whether the government is doing enough to address the real needs of the people, and whether the private sector is just focusing on profitable areas. Wockhardt has formed a foundation to pay for free care and developed lower fees than most private hospitals in India. Still, during press briefings, reporters questioned the private versus public spending and the responsibility of both sectors. Dr. Robert Crone, president and CEO of HMI, commented that HMI's role was to help its partners develop successful models for health care delivery. These had to be financially viable otherwise they would not be sustainable. However, he said, the two sectors should be complementary. He used the analogy of a new highway bypass being built around Mumbai. "The road is costing the government money and it will probably become a toll road. But, at the same time, it will free up the city center for those who can not afford it," he said. At Sri Ramachandra Medical College and Research Institute (SRMCRI) in Chennai, Martin met with faculty and students as well as the school's chancellor, Dr. Shri V.R. Venkatachalam, toured the hospital and gave a Convocation address for 700 graduates from the faculties of medicine, dental surgery, nursing, pharmacy and allied health sciences. Among the graduates were 90 physicians who received a diploma in family medicine, a new program set up by Dr. Krishna Sheshadri, assistant professor of medicine at SRMCRI as part of an effort to further the development of community and primary care. In his address to an audience of over 2,000, the dean congratulated the graduates on their degrees and awards and he stressed the importance of lifelong learning for all health care professionals. Quoting Dr. Alan Gregg of the Rockefeller Foundation, Martin said: "A good education leaves much to be desired." He also congratulated the leadership and faculty for the speed of the college's development and the range of its activities including scientific and medical research, and an active scholarly exchange program with Harvard Medical School. At his last official engagement in India, the dean presented the first Wockhardt Medical Excellence Awards, organized by HMI, to five of India's leading medical professionals: Dr. S. Padmavati (cardiology), Dr. Noshir Wadia (neurology), Dr. Prafulla Desai (oncology), Dr. N. Gopinath (cardiac surgery), and Dr. Sam G. P. Moses (diabetology). All have been responsible for researching and developing innovative technologies to care for their patients in India, and for motivating, training and developing countless numbers of Indian specialists and healthcare professionals. Martin said: "The achievements of these physicians aptly reflect the mission of Harvard Medical School: to create and nurture a community of the best people committed to leadership in ending human suffering caused by disease." "Wockardt super specialty hospitals achieves american clinical quality excellence recognition first in South Asia"
Wockhardt Hospitals, Mumbai, has become the first super specialty hospital in South Asia to achieve accreditation from Joint Commission International (JCI), USA. JCI is the gold standard in global healthcare standards. With this, Wockhardt Hospitals joins an exclusive group of 71 hospitals worldwide, which have passed JCI's stringent clinical quality standards. JCI is the international arm of the Joint Commission on Accreditation of Healthcare Organisations, which evaluates quality standards of US hospitals. "Clinical excellence has been Wockhardt Hospitals' passion and preoccupation all along," said Habil Khorakiwala, Wockhardt Hospitals chairman. "We have always pursued what is best for the patient. We have been able to attract world class doctors who share this vision, helping us set up new benchmarks in clinical care. The JCI accreditation is a recognition of our commitment to clinical excellence," he said. 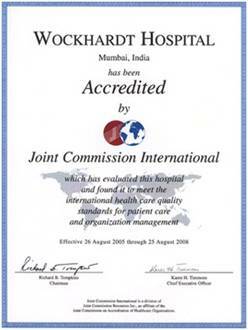 The JCI accreditation follows a rigorous onsite evaluation of Wockhardt Hospitals, Mumbai by an international surveyor team of healthcare experts in August this year. "Healthcare organisations around the world want to create environments that focus on quality, safety and continuous improvement," said Karen Timmons, JCI's chief executive officer, in a message. "The patient community worldwide should be proud that Wockhardt Hospitals in India has made a commitment to quality and safety." Andrew Jeon, chief operating officer of Harvard Medical International (HMI), Wockhardt's partner, said HMI was pleased to have worked with Wockhardt towards getting the JCI accreditation. "The accreditation process requires a hospital to comply with almost 1,300 measurable standards. Wockhardt is the only HMI-associate outside the US to win this recognition," he said. JCI standards and evaluation methods are developed by healthcare experts from around the world and tested in various countries. They are created to provide a framework for risk reduction and are focused on creating a culture of patient safety. JCI assesses the quality of patient care from the time a patient enters a facility to discharge, and utilises the data to plan and implement changes that create optimal care. "Over the last 18 months, our clinical and administrative teams have set high standards in various areas to upgrade our processes of clinical care and service delivery to become eligible for JCI accreditation," Dr. Lloyd Nazareth, general manager, Wockhardt Hospitals at Mulund, said. The hospital's initiatives included creation of medical staff bye-laws to monitor skill sets and training of medical personnel, care pathways for surgeries, clinical guidelines and protocols for care in ICU and emergency areas. The goal was to ensure that treatment protocols are standardised. Every resident doctor had to complete certified training in basic life support, advanced cardiac and trauma life support. Wockhardt Hospitals has become a centre where national trauma management programmes are held. The hospital has established protocols, drills and audits for safe intra-hospital and inter-hospital transfer of patients and similar procedures for infection control and patient safety. Wockhardt is participating in a quarterly global study, which monitors infection rates across leading hospitals of the world. Wockhardt Hospitals vice president Vishal Bali said the JCI accreditation is just another major milestone in Wockhardt Hospitals' quest for excellence and innovation in patient care. "To us, quality is not a sprint but a marathon," he said. Wockhardt now joins the ranks of well-known Harvard affiliated hospitals like Massachusetts General, Brigham & Women and Joslin Diabetes Center, which have the coveted accreditation, Bali said. 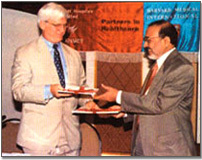 "Wockhardt Hospitals Group, Chairman Habil Khorakiwala (seated center) announcing the JCI Accreditation news with Vishal Bali , Vice President (Operations) Wockhardt Hospitals) and Dr. Harvey Makadon, Vice President , Harvard Medical International , USA"
Over the years, Wockhardt Hospitals has become a global centre of excellence in cardiac care. Wockhardt Hospital and Heart Institute (WHHI), Bangalore, has achieved global recognition as a pioneer in innovative cardiac surgery techniques to help patients who are often termed inoperable. These innovations have saved over 400 lives. WHHI's team of cardiac surgeons has contributed to over 100 articles in professional medical journals on novel procedures they have popularised and are the faculty of choice in live workshops and continuing medical education programmes the world over. WHHI has an arrangement with hospitals in leading cities in China to train Chinese cardiac surgeons in beating heart and awake beating heart surgeries. WHHI is the first hospital in Australasia region to perform minimally invasive beating heart coronary artery bypass surgery. It is the first hospital in the world to perform conscious off pump coronary artery bypass surgery (COPCAB). It was also India's first Heart Care to achieve ISO 9002 certification. Last month, it set another benchmark in heart surgery by successfully performing an awake minimally invasive heart valve repair surgery (AMIHVRS) on a 49-year-old woman in Bangalore. Due to its reputation for excellence in cardiac surgery, patients from Europe and Africa have been flying to Bangalore for treatment by WHHI's team of cardiac surgeons led by Dr. Vivek Jawali. Wockhardt Hospitals in Mumbai is one of the few hospitals in India to offer hip resurfacing, a new technique that is superior to hip replacement. Hip resurfacing is less invasive, preserves healthy bone and enables the patient to spring back to active life early. It enables the patients to squat and jump after surgery, something conventional surgery cannot offer. The JCI accredited institutions undergo reaccreditation surveys every three years and are also subjected to random audits. All JCI accredited hospitals must mandatorily comply with new standards in quality and patient safety, which are introduced from time to time. Wockhardt Hospitals Limited currently runs a cluster of super specialty hospitals in Mumbai dedicated to cardiology, neurology, orthopaedics, ophthalmology and minimal access surgery. It runs Heart Care in Bangalore, Mumbai and Nagpur and a super speciality kidney hospital in Kolkata. Wockhardt Hospitals treats patients from all over South Asia, South East Asia, the Middle East and Africa. In recent months, the hospital has been receiving several patients from Europe. Wockhardt Hospitals is the first hospital group in South Asia to be recognised by the American Blue Cross Blue Shield Association in its worldwide network of participating hospitals. JCI Accreditation for Wockhardt Hospitals is a recognition that it adheres to international standards of clinical care, safe environment, medication safety, respect for rights and privacy, international infection control standards and access to dedicated well trained staff. JCI Accreditation has gained worldwide attention as an effective quality evaluation and management tool. Joint Commission International is a division of Joint Commission Resources (JCR), the subsidiary of the Joint Commission on Accreditation of Healthcare Organizations (JCAHO). For more than 75 years, JCAHO and its predecessor organization have been dedicated to improving the quality and safety of health care services. Today the largest accreditor of health care organizations in the United States, JCAHO surveys nearly 20,000 health care programs through a voluntary accreditation process. JCAHO and its subsidiary are both not-for-profit corporations. Joint Commission International has extensive international experience working with public and private health care organizations and local governments in more than 60 countries. The Joint Commission is an independent, not-for-profit organization, established more than 50 years ago. Joint Commission is governed by a board that includes physicians, nurses, and consumers. Joint Commission sets the standards by which health care quality is measured in America and around the world. In August 2005, the World Health Organization (WHO) designated the Joint Commission and Joint Commission International (a component of JCR) as the world's first WHO Collaborating Centre dedicated solely to patient safety as part of its major initiative-the World Alliance for Patient Safety.